Salt the napa cabbage and allow to sit for 20 minutes. With a clean towel, squeeze any excess liquid from the cabbage. In a large bowl, mix the pork with the ginger, scallions, shallot, chives, sriracha, soy sauce, and cabbage. Season with salt and pepper and mix well to combine. Arrange wonton wrappers in batches onto a clean work surface. Ready yourself a small ramekin with water in it. Place small portions of the pork filling in the center of a dumpling, lightly moisten half an edge of the dumpling and pinch shut, creating small pleats as needed, being sure to seal completely. Set onto a clean baking sheet. Repeat, allowing each dumpling to stand on its own without touching until the sheet is filled. Place in the freezer and freeze for 1 hour. Continue on to fill another baking sheet if able. After the pre-freeze, the dumplings can be frozen together in a resealable bag (without the pre-freeze they stick together in one horrible clump.Trust me). Heat the vegetable oil in a large stock pot. Add the ground pork, onion, garlic, and ginger. Cook, breaking the meat apart with a spoon until the pork is no longer pink, about 5 minutes. Add the chicken broth and bring to a boil. Reduce heat to a simmer and cover, leaving a small opening for steam. Allow the soup to cook for about 25 to 30 minutes. Strain the soup, reserving the liquid. Return the now strained liquid to the pot and bring to a boil. Add the carrots, scallions, and dumplings. Allow the dumplings to boil until cooked through, about 6 minutes, checking one for doneness. 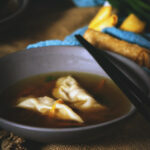 Ladel your Homemade Dumpling Soup into bowls and serve.